Editor’s Note: The City Council of Sebastopol, a small town north of San Francisco, CA, recently passed a resolution opposing a US attack on Iraq. But after five days without power and water and taking back roads to avoid flooded roads, I understood the wisdom of the Council's resolution. We are linked to the people of Iraq. One stormy night, while walking in the darkness of unlit streets and homes, I "got" that in this moment the Iraqi people and the people of Sebastopol shared outlines of the same struggles. However, ours were temporary, minor, and the result of nature. Theirs had been going on for ten years, had dire consequences, and were man-made. In the Gulf War, the first thing "our boys" did, contrary to Article 54 of Additional Protocol 1 of the Geneva Convention, was to attack "objects indispensable to the survival of the civilian population." Power stations, water supply stations and water tanks, hospitals, bridges, roads, and other infrastructure were intentionally destroyed. This began an aerial bombardment that was the heaviest in world history. In the immediate aftermath some 100,000 Iraqis died. By doing as leaders trained us to do, we could see on TV without sympathy; watch without feeling for the fleeing Iraqis running with their hands in the air in surrender and being mowed down by a U.S. helicopter gunship; an act that our troops dubbed "a turkey shoot". Our leaders taught us the trick of not feeling: to hold your breath and call them "the enemy" … but they were just people …like us who wanted to live in safety, have physical and mental happiness, and enjoy their lives. Since then a million-and-a-half Iraqis have died as a result of the U.N. sanctions on food and medical supplies and the contamination of drinking water. While American casualties were first reported as being scant, ten years later in May 2002, according to the Veterans Administration, 8,306 veterans of Operation Desert Shield and Operation Desert Storm had died as the result of combat related injuries; and 159,705 were permanently injured or ill. This is a casualty rate of 29.3% for combat related duties in Iraq between 1990 and 1991; a staggering rate. 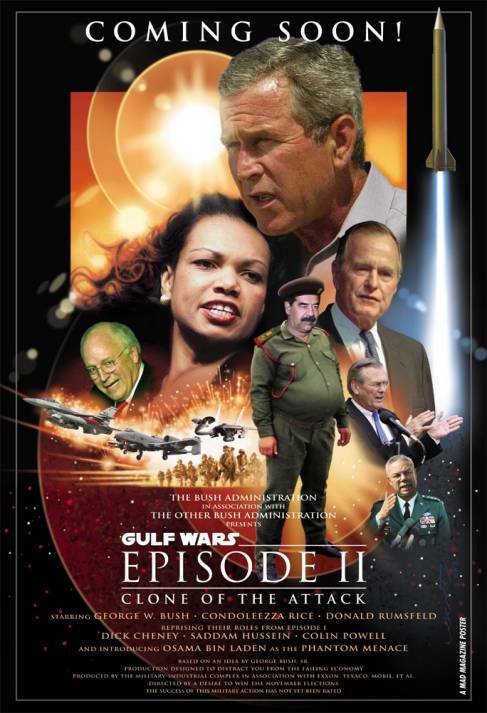 Gulf War 2, The Sequel, made by the same team of directors, and now being previewed on TV is due to open in late January of 2003. It is a far more ambitious project. It includes regime change in Iraq and remapping the entire Middle East. It is estimated that there will be a million refugees fleeing Iraq. We call them "the enemy", but they are just people …like you and I who want to live and in a safe place. As a result of its perpetual war economy, the U.S, one of the richest nations in the world, now has Third World levels of child malnutrition, infant death mortality, and child poverty. Every day more and more businesses are going belly up and more and more people are out of work and without unemployment benefits. Women and children and minorities are experiencing government sponsored and individual violence against them. Our natural resources and social security are being pillaged; and our civil liberties are under attack as is our constitution. Day and night the plummeting of personal freedom is being merchandized to us by our leaders as being an acceptable price for "homeland security". Due to the more ambitious aims of Gulf War 2, it is safe to say that there will also be more American casualties, more violence at home, more poverty, etc. And we in Sonoma County will be far more dramatically affected than just experiencing the skyrocketing price of gas. Already the infrastructure of human services is approaching shambles as the result of inadequate funding for schools, roads, hospitals, fire department, police, parks, water resources, etc. So the new war has come back home to Sonoma County -- even before our grown daughters and sons come back in black body bags or maimed or afflicted by chemical and biological diseases (to be claimed by the Defense Department from unknown origins). Gulf War 2 is described in the media in terms of the Superbowl. However, when the strengths of both sides are compared, the match is the equivalent of having the San Francisco Forty-Niners play for keeps against the kindergartners at Parkside School. Also, the football metaphor through which we describe combat does not fit today’s wars. It describes ancient wars, like the Trojan War, where warriors actually faced off against each other eyeball to eyeball. The main targets of today's warriors are the helpless fans who are trapped in the stadium. Eighty percent of the causalities in war today are people like you and I who live in places like Sebastopol or Santa Rosa or Windsor or Baghdad. Every hour 3 billion dollars is spent worldwide on armaments designed to kill ordinary people like you and I. And are designed to reduce once flourishing cities like Baghdad to rubble, and advanced cultures like Iraq’s to the Stone Age. This is what is called victory. This is what "smart bombs" do. This is what nuclear bombs do plus kill masses of people, some immediately and some slowly; and they strew the planet with radioactive dust, a speck of which in my or your lungs or body, will produce cancer and kill you. The resolution by the Sebastopol City Council is about taking out into the real world, where peace is a necessity, the vision of the imaginal realm: that peace is possible and a desirable alternative to war. The resolution recognizes that we are all connected; that it is one world and that all life forms, are potential targets of the United States' war machine. It, like the plant in the "Little Shop of Horrors", is exponentially reproducing itself in the mind streams of Homo Sapiens and is cloning itself in nation states the world over. This is collective madness and needs to be stopped before it is too late to stop it. We and all life are at risk from human warring. Forget about eradicating the West Nile mosquito and the Glassy Winged Sharpshooter. Eradicate war. Thank you Sebastopol City Council for extending our boundaries to include Iraq. Since we have a Sister City in Japan, the only nation ever bombed with nuclear weapons, how about making Baghdad, the next U.S. nuclear target, Sebastopol's Brother City. Robert Leverant, MFT, is a founding member of Psychotherapists Against the Collective Madness of War.